Fretzels® by Jill chocolate pretzels gifts are gourmet chocolate covered pretzels, individually hand-dipped in milk, white, or dark chocolate and adorned with your favorite candy toppings or drizzled with even more luscious chocolate. You don't need a special occasion to enjoy these mouth-watering treats. Choose an assortment of these outstanding treats to enjoy for yourself, serve as a delectable dessert, or give as an unforgettable gift. Indulge yourself or someone else any day of the year – that is, if you're willing to share! 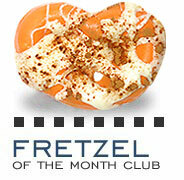 Nothing satisfies that sweet tooth like a Fretzel.